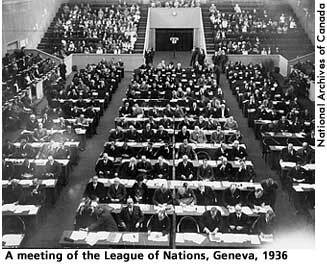 The League of Nations was founded in 1919 as a result of the Treaty of Versailles and the end of World War I. Woodrow Wilson had personally represented the United States at the Versailles peace conference, and he arrived in Paris intent upon establishing a collective security organization that would prevent another world war from ever happening again. The league and its covenant were the ultimate expression of that vision, and President Wilson submitted the treaty to the Senate confident that he could persuade enough of its members to vote for ratification. Although the treaty was ultimately rejected (precluding American participation in the league), the political fight that surrounded the Versailles Treaty proved to be one of the most important episodes of the interwar period. The president campaigned for its ratification personally, criss-crossing the country to deliver speeches on its behalf and placing all of his prestige behind the sole question of ratification. Wilson's opponents in the Senate were led by Henry Cabot Lodge of Massachusetts, a dyed-in-the-wool Republican patrician who opposed the Versailles Treaty on the grounds that it amounted to a cession of American sovereignty. The Senate's refusal to accept the treaty signaled a resurgent isolationism that would characterize American diplomacy through the 1920s and early 1930s. As a liberal thinker and a believer in internationalism, ER supported American entry into the League of Nations, though not with the degree of enthusiasm that the president would have liked. She qualified her endorsement of the league by supporting Henry Cabot Lodge's fifteen "reservations" to the treaty, and yet when the Senate voted it down ER continued to support eventual membership for the United States. She worked hard through the 1920s and 1930s to bring about American entry into the World Court and the League of Nations, even attracting the attention of Congress for the role she had played in awarding the Bok Peace Prize to a league supporter. In this aspect of her public life, ER sought to highlight the league's accomplishments, of which there were many. Between 1920 and 1925, the organization helped diffuse a border dispute between Sweden and Finland, prevented Austria from economic collapse, prevented the outbreak of a war in the Balkans, and had successfully begun the administration of the German Saar region. Despite these successes, however, the league had been forced to cope with some very serious handicaps that would ultimately undermine its effectiveness. Seeking to preserve their national power, the organization's creators had deprived the league of any real ability to enforce decisions that were controversial. For example, when the league ruled that the city of Vilnius actually belonged to Lithuania, the Polish government simply refused to abide by the league's decision. Other more flagrant violations soon followed, such as the French incursion into the Ruhr in 1923, but the league was powerless to punish France or compel a withdrawal. As a result, the league was a relatively weak organization from the outset, and its chances for success were made even worse when the United States had refused to participate as a full member in 1920. By the mid-1930s, however, the league was being consumed by its own inability to exert power, and the rise of fascism in Italy and Germany quickly made it look even more irrelevant. Nazi Germany withdrew from the league in 1933, and Italy attacked Ethiopia in 1935. Neither country was penalized for its actions, but by 1936 the league had become so marginal that virtually all meaningful diplomacy was being conducted on a bilateral level. With the onset of the Second World War, the league had all but ceased to function, although it continued to officially exist until 1945 when its duties were formally usurped by the United Nations. Although the league ultimately failed, the world's experience with it was not entirely without merit. As the international community's initial experiment with collective security, it helped highlight problems with the league's covenant that were corrected in the UN charter. It also helped make the notion of collective security a firm tenet of mainstream liberal thinking, a development that enabled FDR to lay plans for a new global organization in the Atlantic Charter of 1941. Cook, Blanche Wiesen. Eleanor Roosevelt: Volume One, 1884-1933. New York: Viking Press, 1992, 259-260. Lash, Joseph. Eleanor and Franklin. New York: W.W. Norton & Company, 1971, 346-348. Norton, Mary Beth, et al., eds. A People and a Nation. Boston: Houghton Mifflin Company, 1998, 657-660.